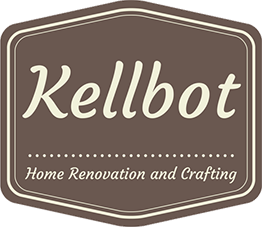 Bathtub Refinishing, Hot Water Stuff - Kellbot! | Kellbot! Last night I had to go down the shore… again.. to let the painter in this morning (because I didn’t want to wake up at 5am to drive down there). For some reason the outlet covers were not removed / painted under when the painters came last week. The manager was very apologetic and came out this morning with the crew leader to fix it. Since I was down there anyway I decided to tackle the tub (which I foolishly did not get a ‘before’ photo of). 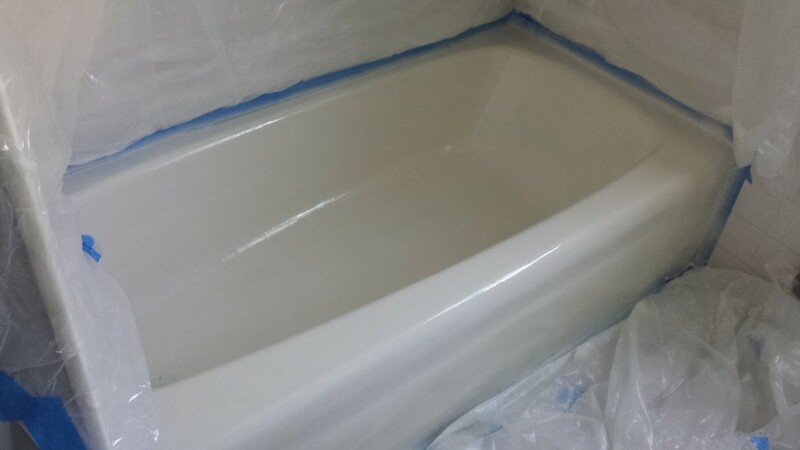 The finish on the tub was scraped off in a bunch of places, and the yellow fiberglass shows through and looks gross. It was also caulked with white caulk, despite being a bisque colored tub, which makes everything look yellow and gross. So last night I stripped off all the old caulk. That allowed me to discover what a mess the tub surround is. For about 5 minutes I contemplated other options, and then decided to just barrel ahead with the current plan to re-caulk and re-enamel the tub. It won’t look great, but it will look better, and I can deal with the bathroom as a whole at some other point in the future. Recoating the tub is fairly easy, I got a tub refinishing kit at Home Depot. First you clean the living daylights out of it using cleaner and steel wool, then you mask everything off, then you spray the enamel on. It looks good, although I’m a little concerned about the durability. The bathrooms are on the to-be-addressed list but there’s a lot of other more critical stuff that has to come first. The enamel needs to dry for 72 hours, so I’ll caulk the seams the next time I’m down there. I’ve got a new theory about the upstairs shower, which isn’t drawing enough hot water to trigger the tankless heater to fire up. Apparently the cartridge in the temperature knob can get clogged with minerals over time. If the cartridge is blocked up that would explain the low water pressure, as well as why the sink in the same room seems fine (and we’ve got a brand new shower head). Meanwhile I’m scurrying around trying to coordinate all the furniture/mattress delivery so that everything shows up before the weekend and I don’t have to make multiple trips down to sign for stuff. We expect the house to be full or nearly-full with family, so we need as many beds as possible.